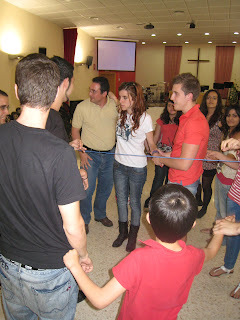 The Link, an activity that has already been mentioned on the blog, was experienced in Jaén. The Link helps participants better understand the Zero File and experience to a certain extent what the characters experience. On May 14th Mar Resa and Gema Alvarez met up with a group of teenagers and young adults to introduce the Zero File to them and to share the Link activity. Together with them were several young people from Málaga who went as volunteeres to help facilitate the activity. "The experience was very positive. They really liked the episodes from the series and all the activities and reflection questions that were presented. In fact, some of them asked us to come back to be able to repeat the experience in their own churches. There is no doubt that the Zero File is reaching so many teenagers and young adults in our country and Link is helping us to get to know their hearts more and more." --Gema Alvarez.